Due to a couple of runway incidents at the Caticlan airport a couple of months ago, all flights to the small airport has been diverted to Kalibo, which has a longer runway and can accommodate bigger aircraft better. All flights, except Seair‘s. Seair’s Dornier 328 next to an oil truck. Yes, the plane is that small. Seair’s Dornier 238 and LET 410 are “aerodynamically designed in a way that it is capable of landing and taking off in about 750 meters with full pay load,” says Seair president Avelino Zapanta. 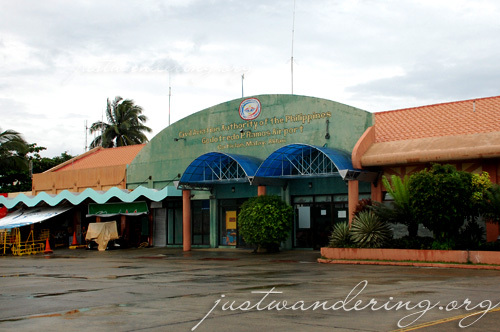 The Godofredo P. Ramos Airport serves Seair flights from Manila, Clark and Cebu. This means Seair is your best option if you have limited time to spend in the islands, or if you’re just that antsy to hit the fine white sand beaches of Boracay. Seair even makes it easier for you by providing free shuttles from the airport to the jetty port and tickets for the boat to Boracay island. It’s also the same going back to Caticlan — Seair reps are waiting at the Cagban port to give you your complimentary boat tickets, and would radio their counterpart in Caticlan to meet your boat. How’s that for service? However, given the rains and strong wind that Aklan is experiencing due to the habagat (southwest monsoon) and the typhoons typical in the country during this time of the year, it is possible that your Seair flight to Caticlan will be diverted to Kalibo. 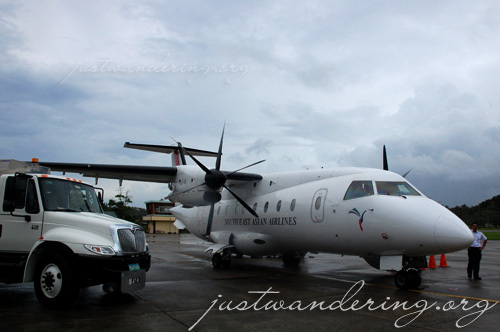 When the wind or the rain is too strong to make a safe landing in Caticlan, the plane will be diverted to Kalibo. But not to worry, as Seair will also be providing shuttles from the Kalibo airport to the jetty port in Caticlan. For flights out of Caticlan, passengers only need to check in at the Caticlan airport for their flight, and they will be taken to the Kalibo airport, if the flight is diverted. As Batanes winter approaches, SEAIR increases flights to this beautiful northern paradise from 4 times weekly to daily starting October 12, 2009. SEAIR resumes direct flights from Manila to scenic El Nido, Palawan on November 18, 2009. SEAIR flies Manila-El Nido-Manila every Wednesday and Sunday. El Nido is located in the northernmost tip of Palawan and is part of the El Nido-Taytay Managed Resource Protected Area, the largest marine sanctuary in the entire Philippines. This group of islands is a perfect destination for divers and snorkelers as well as beach and island-hoppers with over 30 dive sites and more than 50 beaches and hidden lagoons. Aside from its diverse fauna, El Nido also showcases a striking geological wonder: limestone cliffs that were carved extensively from thick layers of coralline deposits. Isn’t scary to fly on Seair? Nope! It’s scary the first time, but I got used to flying inside their small planes already.